run shops to your home. Adirondack Chairs. We use only Western Red Cedar in our furniture. Welcome. 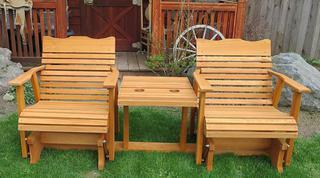 We specialize in quality Amish crafted western red cedar outdoor furniture. 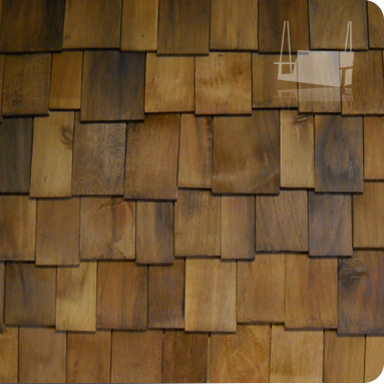 Western red cedar is rated as a very durable wood because cedar is naturally resistant to rot, decay and insect damage. 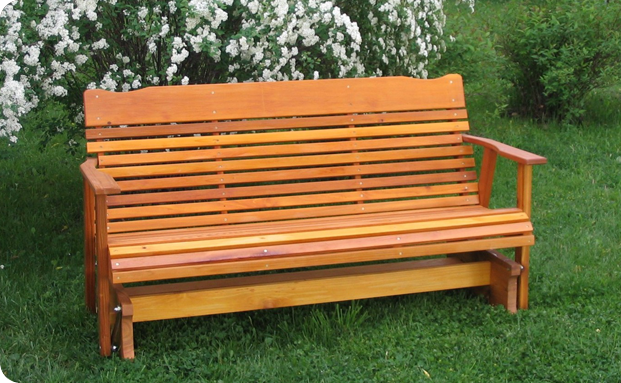 This makes cedar a great natural material for quality outdoor furniture. 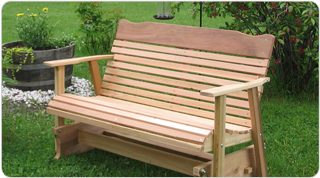 Please take a look at our swing, glider & Adirondack chair pages for more photos. To order, please click on the Order Button shown above on the right which will direct you to our Amazon order page. 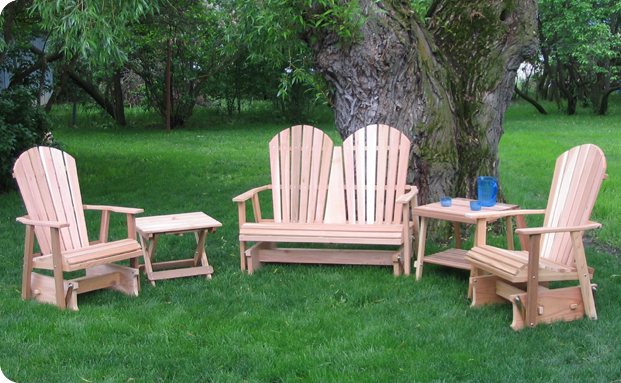 Quality Amish crafted and affordable cedar outdoor furniture since 1999. Made with Pride in the USA. 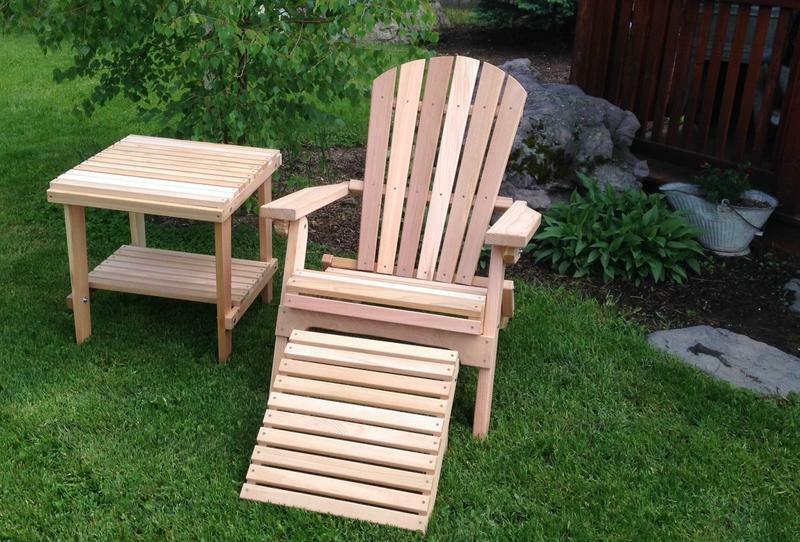 Our cedar furniture is designed for use on your porch, patio, deck, garden or lawn setting. We contour our seats for comfort, use clear cedar slats, and ship all of our easy to assemble furniture will arrive in components, with instructions and hardware. 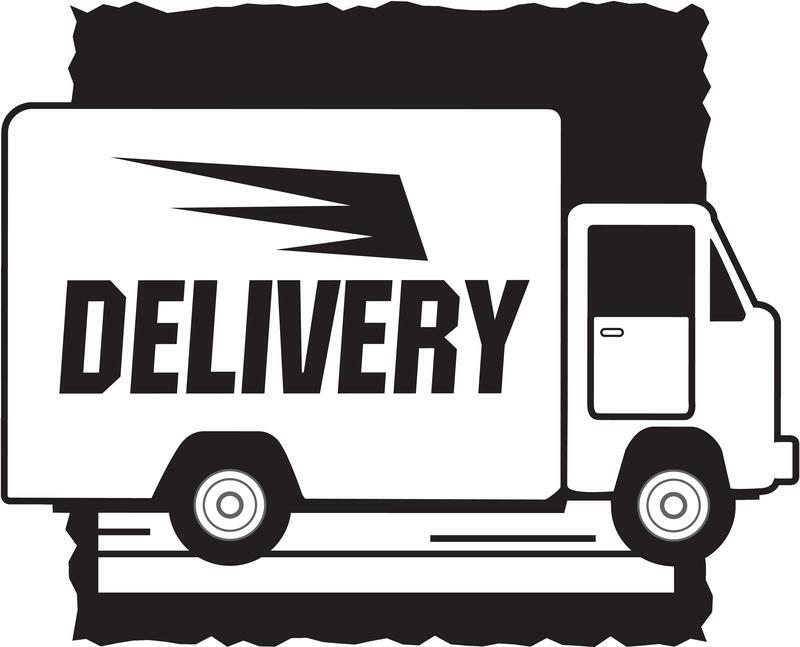 We only ship within the continental USA. 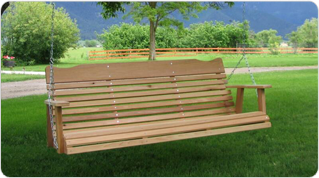 Our western red cedar swings arrive to your door with chain & springs. We have available both a 4’ swing version & a comfortable 5’ wider version. 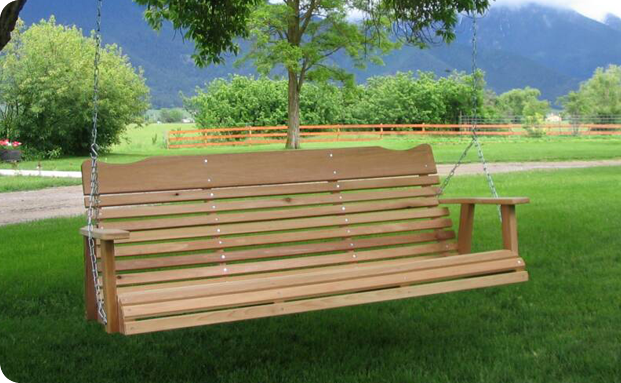 As with all of our cedar furniture, we offer a natural cedar swing ready to be finished or left natural, and a cedar-tinted clear-stained swing. 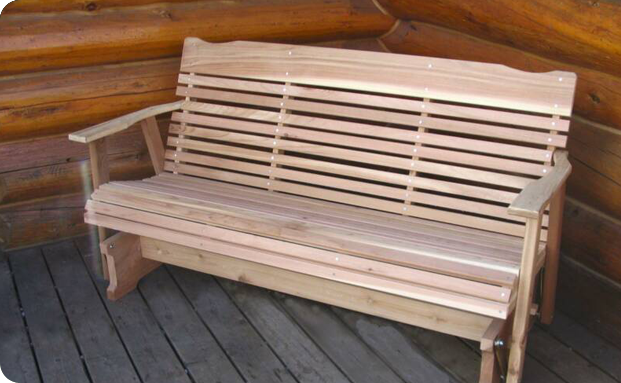 Looking for an alternative to a porch swing, please take a look at our cedar patio outdoor gliders. Kilmer's gliders require very little space, rock with a smooth motion, and can be easily moved. We offer a roomy 2’ cedar glider for one, a comfy 4’ glider, a comfortable 5’ glider, and a settee (which is two 2’ gliders that glide independently, with a fixed table in between). 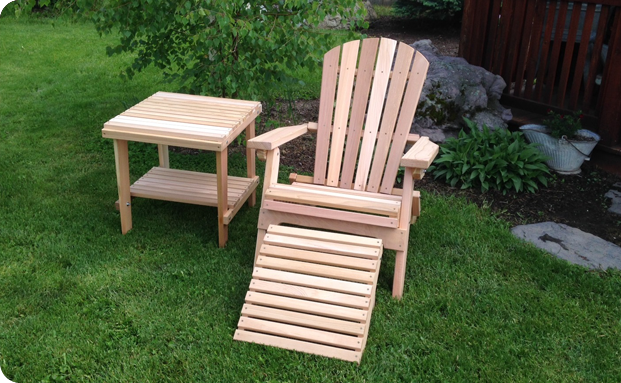 Kilmer's affordable traditional styled folding western red cedar Adirondack chair. 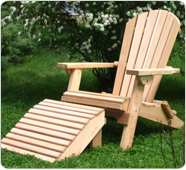 The Adirondack cedar lawn furniture is shipped partially assembled, with a great contoured cedar seat and a barrel style back for comfort. The optional matching cedar ottoman/footstool tapers to the floor. The Adirondacks fold for storage. © 2019 Kilmer Creek LLC. All Rights Reserved.